"Everyone who has tried it has loved this chili; serve with salad, cornbread, and biscuits and you've got yourself a winnin' meal!" Place beans in a large pot and cover with 7 cups water; bring to a boil. Cook beans for 10 minutes. Reduce heat to low, cover pot, and simmer until beans are tender, about 1 1/2 hours; drain. Mix beans, 1 cup water, beef roast, barbeque sauce, chipotle peppers, cilantro, cooking wine, garlic, chili powder, cumin, beef bouillon powder, red pepper flakes, and liquid smoke together in a slow cooker. 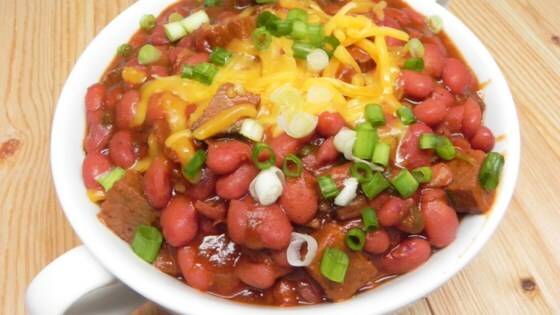 Cook on High until meat shreds easily when chili is stirred, 5 to 7 hours (or cook on Low for 12 hours). Stir chili to distribute meat before serving. Stir 1/8 teaspoon baking soda into water when boiling beans if you are using hard water. I thought it needed more chili powder but other than that it was great as written. Leftover smoked brisket would be great in this too.